WOW. this makes me salivate!!! This looks amazing! Looks GREAT to me. Half pound 8 oz. I like 13 oz. Make a video of it in action please, and how about a video on the lathe you are making it on? Wow! That’s like a work of art. I can’t wait to see it finished! Very nice. Looks so cool!! Well finished it to a playable point. The original plan was to make it a one way bearing top, but I kept messing up the bearing seat. I've thought about how to fix it and eventually plan on doing that if I can. For now I just threw together a fixed tip to slap on it and to see how it plays. It's super fun, but extremely different. The largest top I've played with before this was 3", so this thing feels massive! Here's a video of me attempting to use it, might have gone better if I decided which tricks to do before I started throwing. Ended up being 300 grams (10 1/2ish oz) with the fixed tip, that's a number I can live with! WOWWW... I want one so badly... It looks amazing!!! Good job! 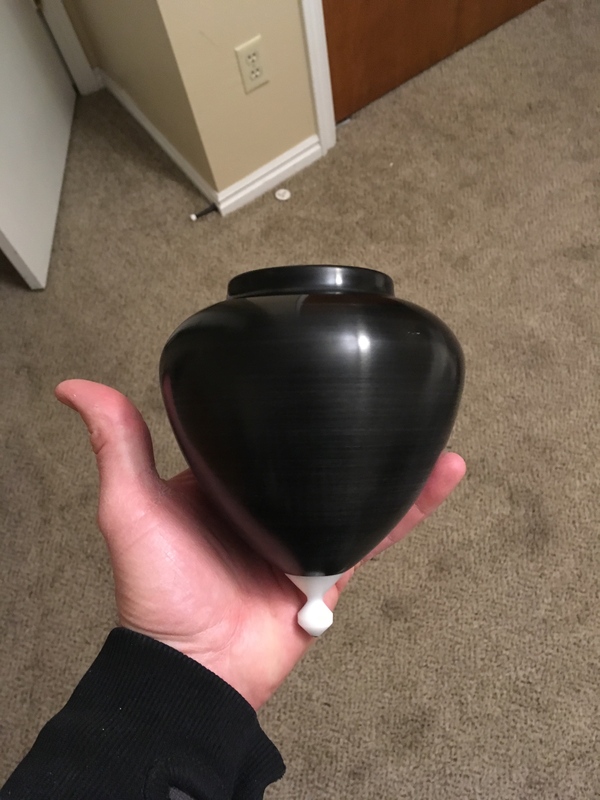 Only 300 gr for a 5" delrin top? You must have carved it really well. I was pretty nervous hollowing it out. Took a lot of time and light passes when I got close to my target width to try to keep things from getting too thin. The walls ended up being just shy of 4mm thick (I was shooting for 0.15"), though I did add a hair of width at the widest part (just over 1 mm). It feels pretty solid, but we'll see how durable this thing ends up being in the long run. I think you did a FANTASTIC JOB. I like straight tips only. I want the stairway to heaven and the wire walkers. My self I would have made the wall 1/4 inch to be safe. Take that honey to the park use long line and let HER fly. JUST BEAUTIFUL. Thanks! 1/4" would have been way too heavy for me, I figured try making it thinner than there's not too much money down the drain as the blank was pretty cheap, but it does feel pretty solid. We'll see what happens. Really nice! Is the tip also delrin? How is it attached? Beatifut top! And it looks pretty playable! Yep! Tip is also delrin. I put a metal machine screw through the tip to reinforce it, this extends through the back of the tip and there's a nut on the inside of the top holding the tip in and in place. Beautiful! You can't go wrong with black and white.